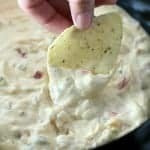 A creamy cheesy slow cooker dip with just the right heat from jalapenos and chilies. The perfect dip for easy entertaining for holidays, game day and family gatherings. Saute the onion, jalapeno and garlic with canola oil in a medium skillet over medium heat until the onion is translucent about 4-5 min. Salt to taste. Add the tomatoes and cook for 2-3 min. Spray a medium bowl of a slow cooker with cooking spray. Add the vegetables, top wtih the green chilies, Tex Mex cheese, cream cheese and 1/2 cup milk. Stir to combine. Cook on low for 1 hour, stir to combine and continue to cook for 30 min. more or until cheese is melted and bubbly. Add more milk, by the Tbsp. if the dip becomes to thick. Can leave heating on warm for 3 hours, stirring as needed. Serve with torilla chips.